The ancient Roman village of Buti, in the province of Pisa, is celebrating St. Anthony the Abbot this Sunday, 22nd January, with its renowned Palio of Buti. Held the first Sunday after the celebration of the Saint (17th January), this is, together with Siena’s, one of the oldest Italian horse palios. 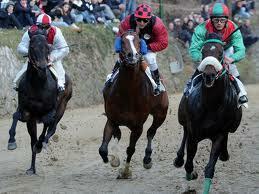 The event is centred on a horse race, with 7 horses and riders, representing the seven contrade, or town quarters. The race itself takes place along the main road of town. 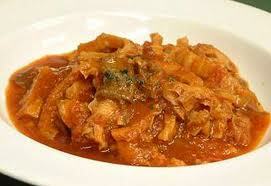 Early on the Sunday morning a mass is held for the jockeys, la Santa Messa dei Cavallai, after which every one returns to their quarters, where, in the local inns, they find themselves around a hot, fuming dish of their traditional trippa, tripe. Subsequent to these celebrations, the quarters parade down the town’s streets until they meet in front of the Cathedral, where the jockeys receive their shirts and caps and the horses are blessed. The race starts at 2.45 pm and is ran on a dirt course of 750 m. Three horses are drawn for 2 races and in the third those coming second in the preceding races run with the 7th horse left out. The winners of all 3 races compete in the finals. The winning quarter receives the town’s drape. In the last few years a historical pageant has been added to the celebrations. 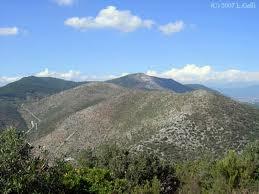 Located on the eastern slopes of Mount Pisano, Buti is surrounded by olive groves and chestnut woods. Nearby are the protected area of Monte Cucco, famous for its larch pine trees, and the wild park of Monte Serra di Sotto, with a breathtaking landscape made of chestnut groves and pine forests and its fascinating fauna. For those wishing to spend a holiday in this area of the Pisan countryside we suggest one of our holiday accommodations in Latignano, near Buti. Questa voce è stata pubblicata in Culture and accommodations in Tuscany, Folklore and accommodations in Tuscany. Contrassegna il permalink.